Luxury Swiss watchmakers Breitling combine sleek design and high-performance technology for this ladies' Galactic 32. Featuring a polished stainless steel bracelet, an elegant white mother of pearl dial is embellished with diamond hour markers. A seamless blend of classic and contemporary styling. 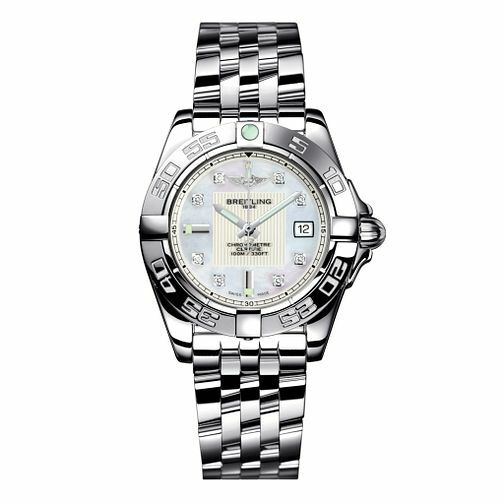 Breitling Galactic 32 ladies' stainless steel bracelet watch is rated 5.0 out of 5 by 1. Rated 5 out of 5 by Anonymous from This product has style!!! Bought this watch as a Christmas treat for myself . The quality is outstanding,looks very elegant on the wrist . Its amazing the amount of people that have commented on this watch ,it's a pleasure to wear , would highly recommend this product , you won't be disappointed.